Western Digital today introduced the WD Black SN750 NVMe SSD series that is targeted to gamers and hardware enthusiasts. This isn’t the first time I’ve seen a storage drive targeted at gamers, so I was excited to see what WD was releasing. Hopefully WD wasn’t just slapping a heatsink on the drive and calling it a gaming drive like so many others have done in the past. It would be neat to have an NVMe drive series available that was truly optimized in the firmware and hardware for gaming. 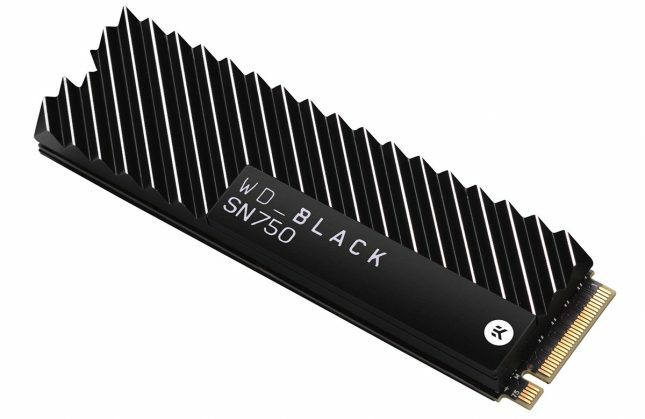 Back to the WD Black SN750 NVMe SSD series… The SN750 is available in 250GB, 500GB, 1TB and 2TB capacities with price of $79.99, $129.99, $249.99 and $499.99, respectively. The SN750 comes in the standard M.2 2280 single-sided ‘gum stick’ format, but there will be two skus available for some of the capacities. 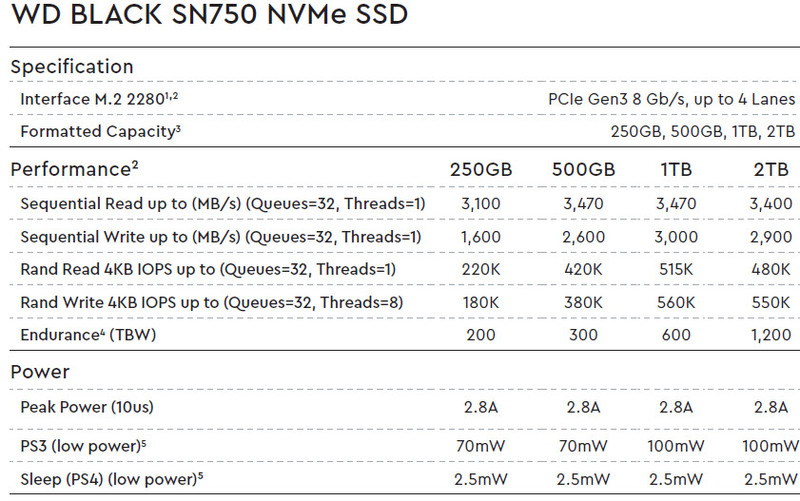 This is because the 500GB and larger SN750 series drive will be made available with an M.2 heatsink made by EKWB. WD says that the heatsink dissipates heat from the drive better, allowing the SSD to run for longer periods of sustained read and write performance, compared with non-heatsink versions. 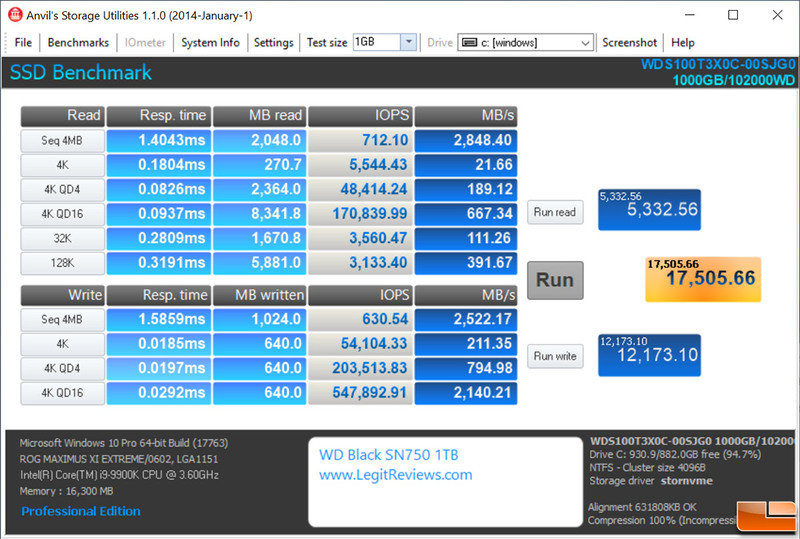 Speaking of performance the WD Black SN750 has plenty of it. The SN750 1TB drive is rated as having sequential performance of up to 3,470 MB/s reand and 3,000 MB/s. Random 4K performance is also strong with up to 515,000 IOPS read and 560,000 IOPS write. WD was able hit these pretty impressive performance numbers with their own designed in-house controller that has been paired with 64-layer 3D TLC (BiCS3) NAND Flash memory. It would have been nice if WD used the latest 96-layer BiCS4 NAND Flash, but they are likely saving that for the next WD Black series. 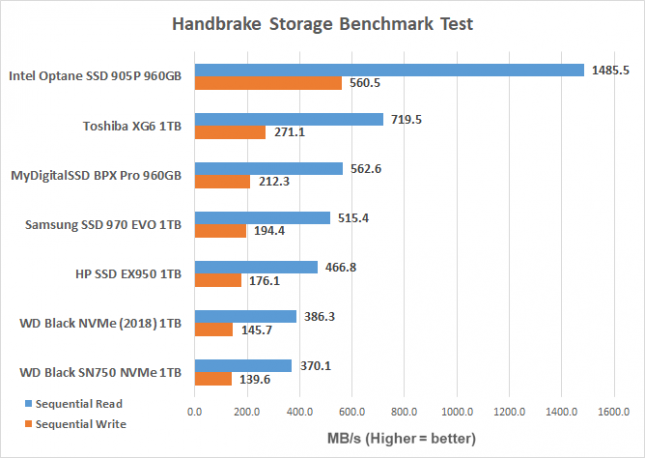 The endurance rating on these drives is also respectable with 200TBW on the 250GB drive, 300 TBW on the 500GB drive, 600 TBW on the 1TB capacity and finally 1,200 TBW on the largest 2TB drive. The 2TB drive will be single-sided and is expected to become available to purchase in February 2019. All of the SN750 sereis drives are backed by a 5-year warranty and have a MTTF of 1.75M hours. 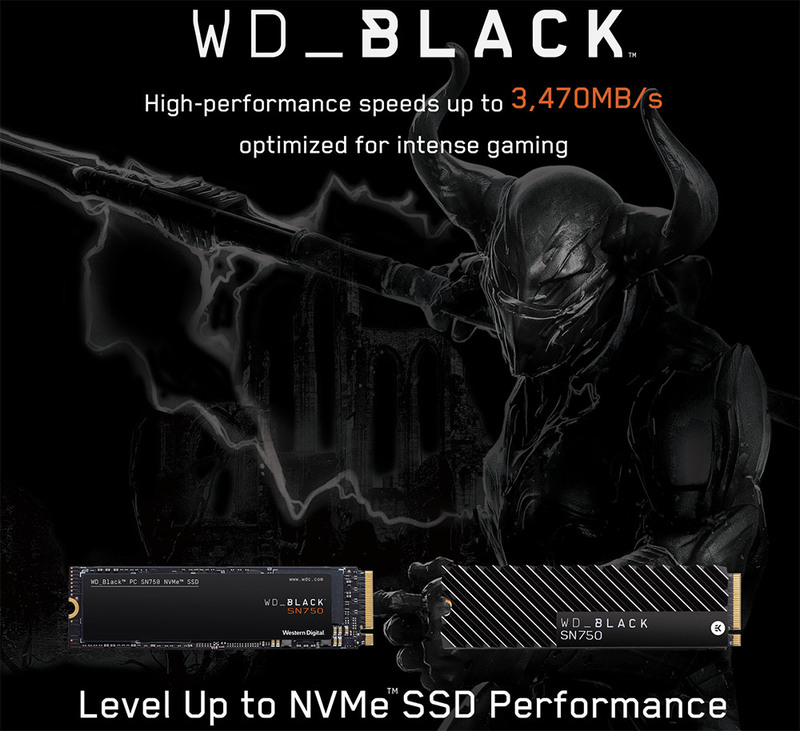 The WD Black SN750 NVMe SSD series gets an updated SSD Dashboard that is a must for gamers as it allows you to enable gaming mode. WD SSD Dashboard has a new look and feel for WD Black products going forward and you can see the new GUI above. I really don’t like how it looks, but it is functional and that is all that really matters here. Gaming mode disables the systems idle low power states (PS3 & PS4) on the host and the drive. WD informed us that the drive should be running in active power state PS0 only when in gaming mode. Unfortunately, enabling/disabling ‘Gaming Mode’ to get this feature requires you to restart the system, which really stinks. If you transfer the drive to another system it will keep the mode that was previously set. The bad thing with this implementation is that no gamer wants to restart their PC each and every time they want to game. You could just leave it in gaming mode all the time, but we all want to be energy efficient and green these days. Anyway, WD is doing this to reduce latency in order to improve system responsiveness and ultimately game load times. This is something that advanced users can do in the UEFI on many motherboards, but this is a much simpler solution for the masses. WD send over the Black SN750 1TB SSD for Legit Reviews to try out. The retail packaging is entirely new for this series and looks great! To test out performance on the WD Black SN750 series I’ll be using an Intel Core i9-9900K processor on the ASUS Maximus XI Extreme (Intel Z390) motherboard. The system has 16GB (2x8GB) of DDR4 3200MHz memory and is running Windows 10 Pro 1809 with all available updates. 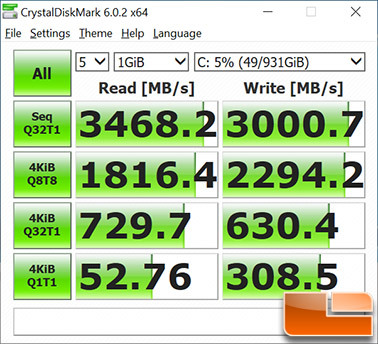 The first benchmark that we ran was CrystalDiskMark 6.0.2 and we hit speeds of up to 3,468 MB/s read and 3,000 MB/s write for sequential performance. That is pretty much spot on with the drives rated speeds of 3,470 MB/s read and 3,000 MB/s write. We should point out that all of our testing has been done with Windows 10 Pro v1809 installed and the SN740 1TB drive is the primary drive. Next we ran Anvil’s Storage Utilities Benchmark and we got an overall score of 17,505 points. 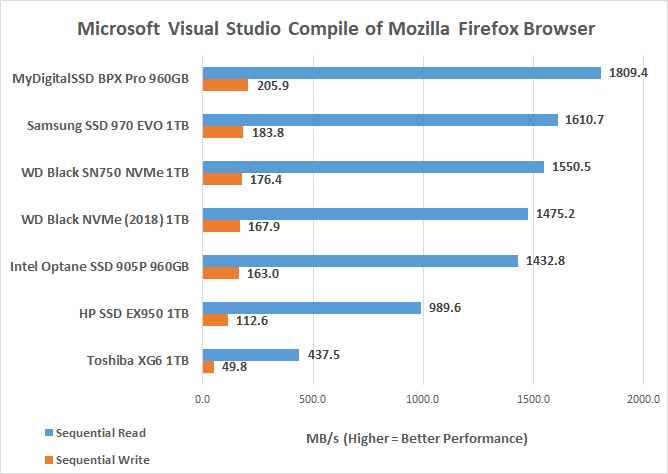 That is about as good as it gets for M.2 PCIe NVMe drives and the 4K performance was looking pretty decent at 5,500 read and 54,000 write at QD1 and 170,000 IOPS read and 547,000 IOPS by QD16. When it comes to more real-world workloads we found the WD Black SN750 to be one of the better performing 1TB drives that we have looked at recently with slightly better performance than last years model thanks to the controller optimizations. The only area where the WD Black SN750 didn’t do that hot was on the Handbrake encoding workload and we’ve been working with WD to find out why this is the case and to see if there is something that can be done to improve performance. So, the last and most important test is game load times. 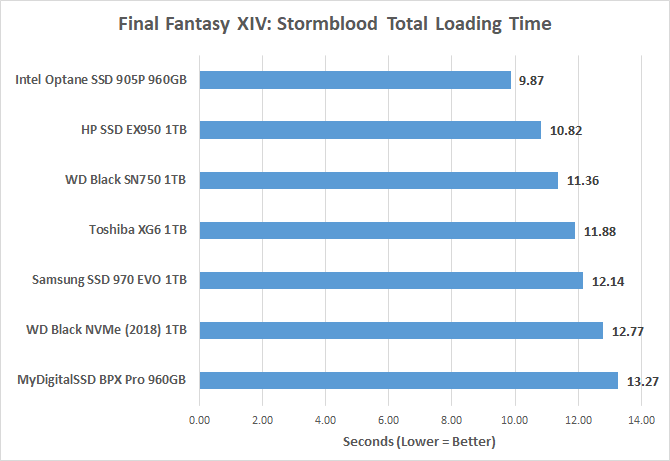 This is a gaming drive and we wanted to see how the SN750 performs against these other drives with Final Fantsy XIV: Stormblood running at 1080P with a discrete graphics card in the system. 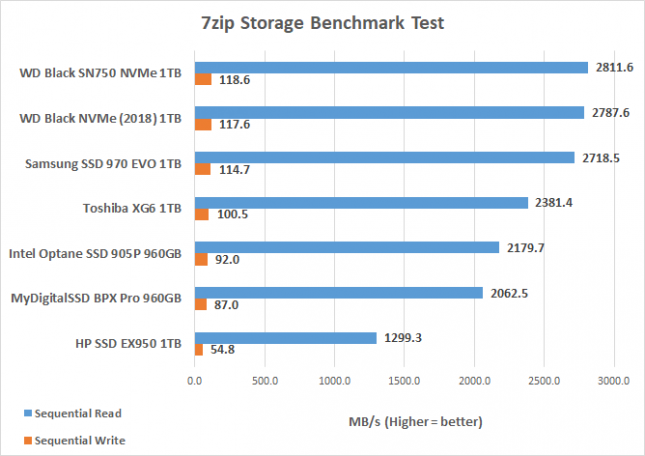 The WD Black SN750 1TB drive performed in the middle of the pack of fellow 1TB NVMe drives with the HP SSD EX950 1TB and Intel Optane SSD 905P 960GB drives being the only two that we have tested to date that are faster. These results are with game mode disabled. I’m doing more testing with game mode and will hopefully be able to publish more results down the road. 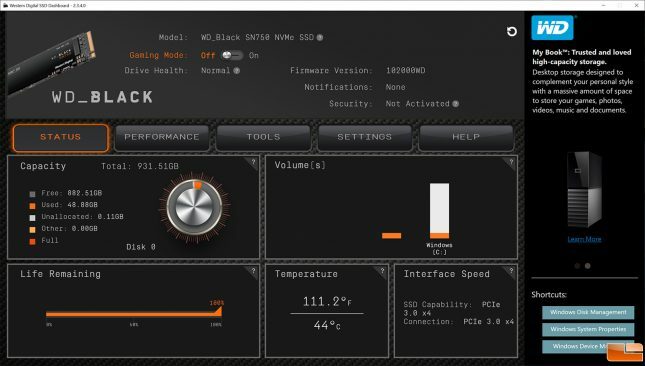 The WD Black SN750 NVMe SSD series is basically a refresh of last years model with updated firmware and a new dashboard that allows you to disable low power states. It would have been nice to see newer NAND Flash being used, but WD stuck to BiCS3 NAND Flash for this drive. That said, the SN750 performed better than the last WD model in most benchmarks and that is a good sign. 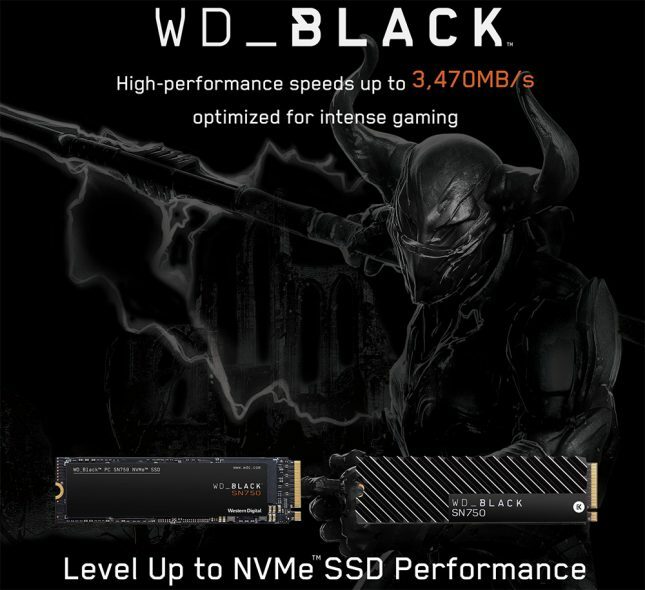 Gamers will likely be looking at the WD Black PC SN750 NVMe SSD series since it is launching at PAX South and is being targeted towards gamers. I think most gamers will be willing to wait a month or two for the model with the EKWB heatsink to come out. WD didn’t give us any guidance for how much extra the heatsink was going to add to the cost, but it looks great. WD also said that it helps keep controller temperatures down for desktop applications and that is always a bonus. So, WD now has a 2TB capacity NVMe drive solution on a single-sided M.2 2280 form factor drive. 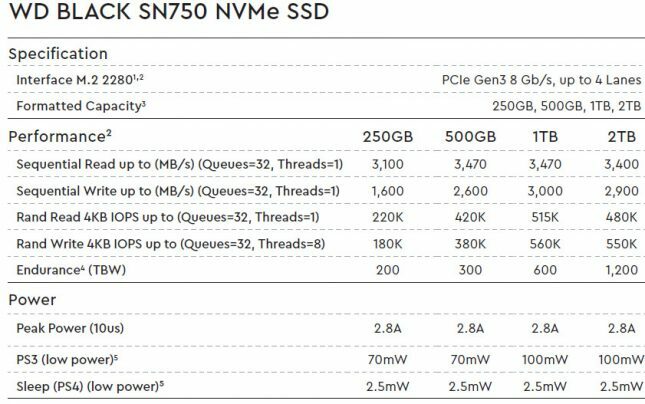 The SN750 is available now without a heatspreader in capacities of 250GB ($79.99), 500GB ($129.99), 1TB ($249.99) and the largest 2TB model is coming next month for $499.99. All of the heatsink models will be coming next month and will be available on the 500GB and larger drives. 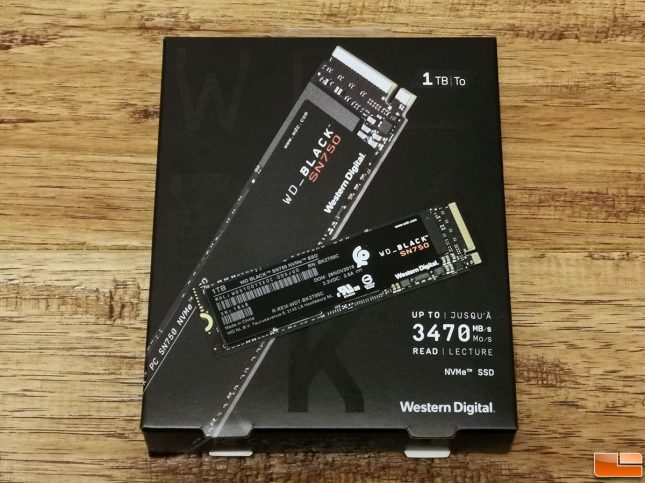 Last years WD Black NVMe SSD 1TB model launched at $449.99 in March 2018 and was available for $189.99 during the 2018 holiday shopping season. This drive comes in about $70 higher than that, but we expect pricing to settle down in the months ahead. Legit Bottom Line: We are getting closer to SSDs that are truly optimized for gaming and that is super exciting. The WD Black SN750 1TB drive that we looked is certainly a big step in the right direction as companies are finally doing more than just slapping a heatsink on an SSD and calling it a gaming drive.